We all know and agree on one fact – when it comes to securing cryptocurrencies like BTC, ETH, etc., nothing beats the reliability of hardware wallets. However, choosing any hardware wallet to secure your crypto may not be a wise decision. CoinSutra recommends the Trezor hardware wallet because it is one of the pioneer Bitcoin wallets in the cryptosphere. And with time, it has also adapted to support BCH, LTC, and ETH. The thing with Ethereum is that it is not only a cryptocurrency but also a platform for DApps which are heavily dependent on smart contracts. And hardware wallets like Trezor have struggled to come in terms with DApps and smart contracts. But that, dear readers, is going to change forever. In the latest news, Trezor has integrated with the MetaMask wallet. For those of you who don’t know about the MetaMask wallet, here is a brief description of the same. MetaMask wallet is a simple GUI-based wallet for Ethereum blockchain which can be used to read, write, and deploy smart contracts. It is also like the web browser for DApps which are otherwise not accessible from normal web browsers. MetaMask comes as a browser extension that makes your current browser compatible with Ethereum DApps. So now with Trezor and MetaMask’s integration, you can easily access your Ethereum DApps using your Trezor wallet and much more. You no longer need to transfer ETH from Trezor to MetaMask and then access your DApps or smart contracts. With this integration, you can do everything using the Trezor wallet via MetaMask. You can now check your account balance, send, and receive ETH through MetaMask interface while connecting to your Trezor wallet. Moreover, with this integration of Trezor and MetaMask, your funds will remain secure in Trezor while giving you access to an advanced blockchain browser like MetaMask. When you connect your Trezor device with MetaMask, your ETH account will be reflected in MetaMask’s UI as Trezor account. Upon opening it in the app, you will see its entire transaction history, balance, etc. 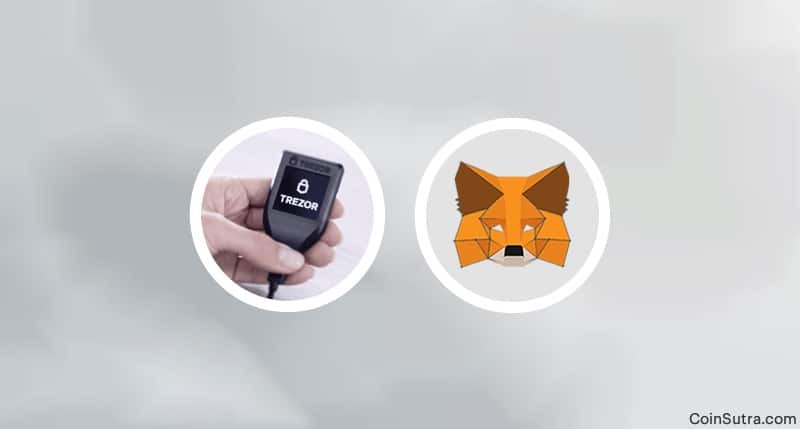 However, all the operations which require signing with your private keys will happen through the Trezor device only and MetaMask will only send requests to Trezor. Take for example, while signing a transaction or a message. Download the latest version of MetaMask and install it in Google Chrome (the only supported browser at the moment). Use the beta interface for now. Here is How. Click on the account icon at the top right corner and select “Connect Hardware Wallet”. Plug in your Trezor and click on “Connect Trezor”. Trezor Connect will pop up, with a request to export public key. Approve to continue. Select the account you want to use and click on “Unlock”. Well, I think this a huge development for MetaMask and Trezor both as it opens up endless possibilities for DApps and other ERC20 tokens. Plus, with this integration, one will be able to secure ERC20 and ETH in a much more reliable way. What do you think of this integration of Trezor & MetaMask? Have you tried this integration? How has been your experience? Do let me know in the comment section below.